Artist, architect and landscape designer, Edward La Trobe Bateman was born in 1816 in Yorkshire, the son of La Trobe’s father’s sister, Mary, and her husband, John Bateman. 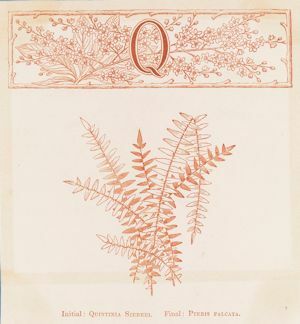 Before departing England for Australia, he had established a reputation as a fine botanical artist and ‘illuminator’, and he was close friends with the members of the Pre-Raphaelite Brotherhood. 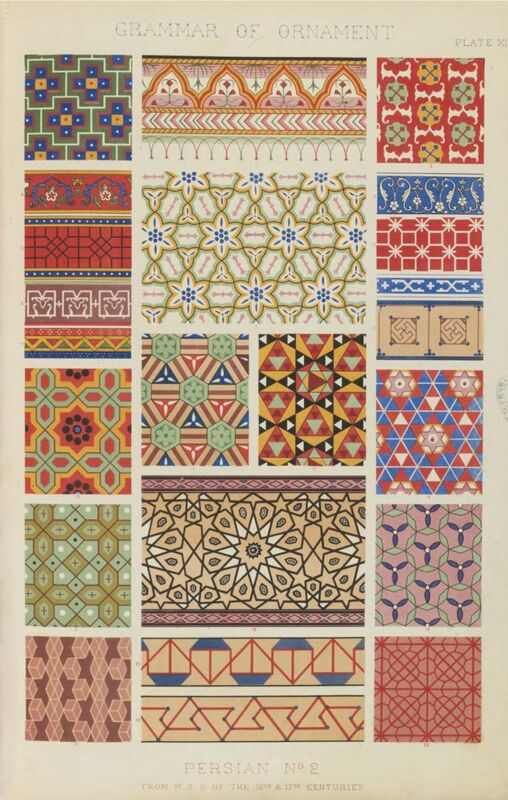 He came to Australia directly after working with the influential design reformer Owen Jones on the Fine Arts Court of the Crystal Palace for the Great Exhibition of London in 1851 and on Jones’ influential text, The Grammar of Ornament (published in 1856). He travelled to Australia in 1852 with two other Pre-Raphaelites, sculptor Thomas Woolner and painter and sculptor Bernhard Smith. 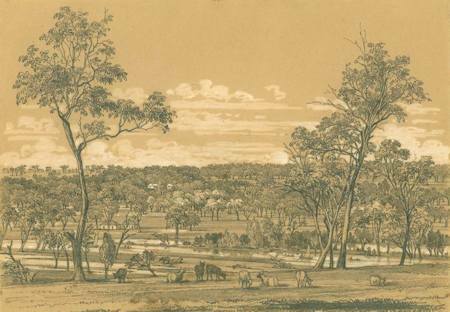 On arriving in Melbourne he stayed at his cousin’s Jolimont estate and subsequently produced a set of twenty-two drawings of Jolimont. His friends the Howitts arranged other commissions for him. In the years following La Trobe’s departure from Melbourne in 1854, Bateman developed a significant career in landscape architecture and design, designing many public and private Melbourne gardens, including the garden plan of the University of Melbourne, with a system (or botanic) garden at the School of Botany; the Williamstown Botanic Gardens, the Carlton Gardens and Fitzroy Gardens. After this time, the long-term partnership between Edward La Trobe Bateman and Joseph Reed, the leading Melbourne architect of the day, commenced – a professional association which continued through the 1860s. 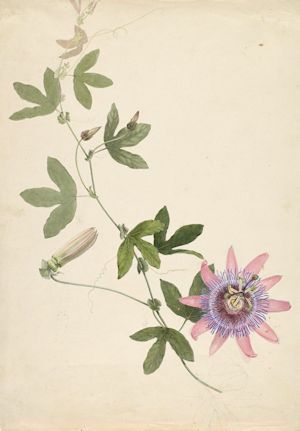 At the Melbourne Public Library, Bateman redecorated Queen’s Hall in a scheme of painted and stencilled polychromatic ornament; he then designed floral illustrations for the Library’s Catalogue of 1861 and 1865, and the following year he decorated Reed’s Great Hall and Rotunda of the Intercolonial Exhibition buildings on the eastern boundary of the Library, once more in a painted and stencilled polychromatic scheme. It is acknowledged that Bateman designed the original garden at Rippon Lea, one of many Melbourne buildings by Reed & Barnes, architects. It is thought that he designed not only the garden, but also the house, at Barragunda, Cape Schanck, Heronswood at Dromana, and Kolor at Penshurst. While these projects were being developed during the 1860s, he was also busy designing other gardens in Victoria’s Western District, including Chatsworth near Mortlake, Wooriwyrite at Terang and possibly Meningoort at Camperdown, and also Beleura at Mornington. 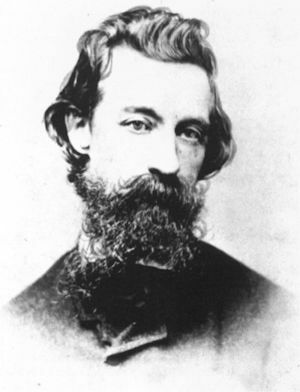 Bateman returned to Britain in 1869, with a disabled right arm, and lived on the Isle of Bute, near Glasgow in Scotland, for the rest of his life. A passion for design reform and a fascination with nature was a common thread throughout his work. Daniel Thomas, 'Bateman, Edward La Trobe (1815?-1897)', Australian Dictionary of Biography, Melbourne: Melbourne University Press, 1969, Vol 3, pp.117-118. Helen Botham, ‘Edward La Trobe Bateman and Kolor’, La Trobeana, Vol 11, No 2, June 2012, pp.37-39. Harriet Edquist, ‘The Other La Trobe: E L Bateman at the Melbourne Public Library, 1860-1866’, La Trobeana, Vol 13, no 1, March 2014, pp.6-12. Harriet Edquist, Building a New World: a history of the State Library, Melbourne: State Library of Victoria, 2013, pp.36-43, 86-93. Anne Neale, ‘The Garden Designs of Edward La Trobe Bateman (1816-97)’, Garden History, Vol 33, No 2, Autumn 2005, pp.225-255.